Front this railroad station Abraham Lincoln gave his last speech to Springfield. We collect National Park cancellation stamps when we travel within the USA. On the way out from Springfield, Ilinois Denise asked if I could get a quick stamp from the old railway station in Springfield. “Hello,” I replied. Must be a park ranger I thought. Wow, this place must not get many visitors. What is this guy talking about?! I went to the next room from where I heard the voice. 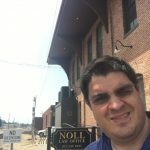 It was at that point that I came face to face with a video projection of an actor portraying Abraham Lincoln, giving Springfield a farewell speech from the station (sadly he never came back). And that is my story on how I had a conversation with Lincoln. I am happy to say Lincoln was a kind host and I was able to get my stamp and continue on my way. 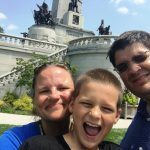 Abraham Lincoln is an interesting character in history because he is so well loved that he is claimed by so many places. 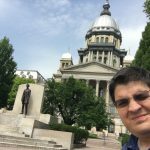 He was born in Hodgenville, KY in a simple log cabin, but as an adult he clearly made Springfield, Illinois his hometown. Lincoln’s home is a modest home but it is yellow, which in the 1800’s was a very expensive color. 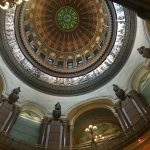 In 1839, Springfield had become the new capital of Illinois. 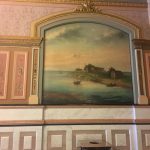 In 1842 Springfield was a growing city and was a perfect setting for Lincoln to set up a law practice. Him and Mary were not poor but they did not have a lot of money either. The story goes that when Lincoln arrived he asked the local shopkeeper how much bed sheets were and when he was told they were $17 he had to buy them on credit from his profits as lawyer. Lincoln’s practice went well and he was soon able to pay off his debit and in 1843 for $1,500 he was able buy a house and a small plot of land. 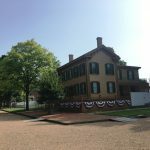 Lincoln’s home started out modest and as his prestidge grew so did the house. 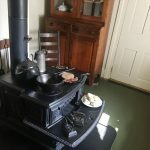 Mary Todd Lincoln employed help but she really liked to cook so she had a very nice stove (even though the kitchen itself was small). 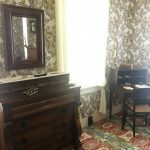 The highlight of the house was seeing Lincoln’s desk. I can only imagine all the idea he had there. Unfortunately, Abraham Lincoln never made it back to Springfield alive. After being assassinated, there was a very solemn funeral train back to Springfield in which Lincoln was laid in state at the capitol building and then at the Oak Ridge cemetery in a huge memorial tomb. The gold inside Lincoln’s tomb was donated by California. 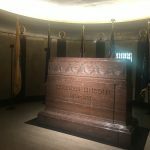 The Lincoln tomb is an impressive structure that features on the outside scenes from the civil war and on the inside impressive amounts of granite and marble. In the first room you will find the model sculpture that is featured at the Lincoln Monument in Washington DC. The dome in the first room is made of palladium which is supposedly one of the more durable metals on the planet. In the burial chamber you will find a big tombstone, which 10 ft. under is buried Abraham Lincoln. They had to bury Abraham Lincoln under 10 ft. of concrete to prevent grave robbers. Also in the burial chambers is the crypts of Mary Todd Lincoln, and three of Lincoln’s four sons, Edward, Willie, and Tad. 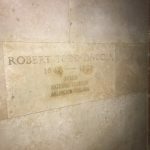 There is a memorial to the eldest, Robert Todd Lincoln, who is buried at Arlington National Cemetery, which is interesting because if you look close they made a mistake on his birth year and had to correct it (he was born in 1843). If the tomb looks bigger than it should be it is. It was meant to be a tomb big enough for all of the Lincoln family, but most of the Lincoln family chose to be buried elsewhere so they wouldn’t be overshadowed by President Lincoln’s memory. 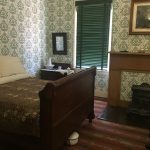 Lincoln’s bed is modest, it is also noticeable that he had a separate room from his wife. Lincoln’s desk. I also thought the carpet was very decorative. Lincoln is eternally in front of the capital building. I thought it funny that the “cornerstone” was not actually attached to the building. 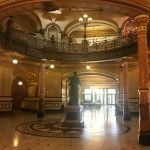 The Springfield Capitol was built with modest funds, which meant they didn’t have money for fancy wood or stone, so they painted everything to make it look fancy. One of the local foods I found was Cracklins, fried chicken skin. 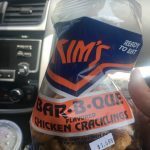 It was OK, but I prefer pork grinds. 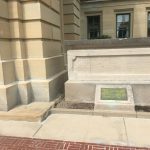 If you look close you can see they changed the year from 44 to 43, even though Robert Todd Lincoln was not buried in Springfield. Outside the Lincoln tomb it shows scenes from the civil war. 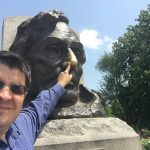 There is a tradition that you are supposed to touch Lincoln’s nose. Not sure why, but it is really shiny from all the touching. 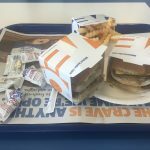 Tried White Castle, the oldest fast food restaurant in the USA. Only available in the east coast.